The FRENCH BACCALAUREAT or The "BAC"
What is the French Baccalauréat or the Bac? The French Baccalaureat (Bac) is the diploma that marks the completion of a French high school program and follows the curriculum guidelines established by the French Ministry of Education, a demanding pre-university program of study taught entirely in French. In Canberra, there is one French entity called the Lycée franco-australien that delivers the French curriculum from Kindy (Grande Section de Maternelle) to Year 12 (Terminale). The students start at Telopea Park School and finish at Narrabundah College. Students start their French high school program in the middle of year 9 (Seconde). During the second trimester of Seconde, they will be asked to choose a specialized program of study (what we call "series" or stream) within a core curriculum. The diploma is obtained at the end of Terminale, after externally assessed examinations are taken, and is an essential credential for entry into any university worldwide. What are the "series" (stream)? As of year 10 (Seconde) students at Telopea choose one from two séries: L "littéraire" (literary stream), and S "scientifique" (scientific stream). Within the tracks, certain courses are considered to be more challenging than others and are weighted more heavily in the Bac examination. All students study the common core subjects: French literature, one foreign language (started in Year 7 at Telopea), Sciences, History-Geography, Philosophy (in Terminale), Physical & Sports Education. The level of difficulty of some subjects will depend on the série chosen. In Terminale, the students must also select a "speciality" or "spé" (see below). In all subjects, a mastery of both written and spoken French is essential. "Spécialités or Spé"In Terminale, the students are required in addition to the core subjects to select a specialty “Spé” that is related to their série. The speciality adds teaching time in the subject and the value of the subject counts more in the overall baccalaureat score. They emphasize certain aspects of the program of this spé. In Terminale L, they have a focus on English language and literature. 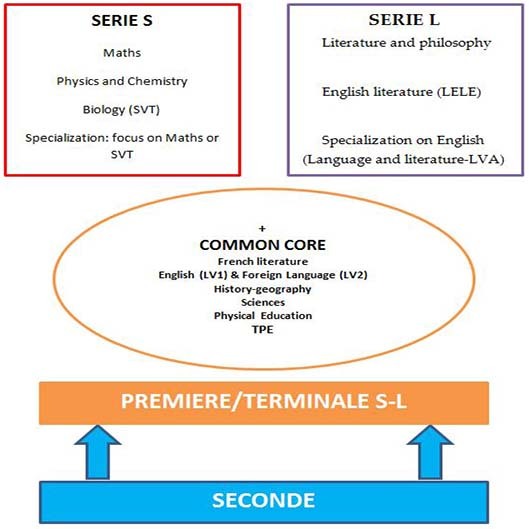 In Terminale S, they can choose between Maths and Biology (SVT). In their first year of the French Baccalauréat (1ere), students must undertake their TPE in groups of 2 or 3. TPE is a piece of original personal research which aims to allow students to study an interdisciplinary topic linked to the dominant subjects in their chosen série. They have an oral exam where they present their project in group. It’s their first Baccalauréat exam. Lycée students often carry a course load of around 30 hours per week, with a corresponding amount of homework. School hours vary, but normally run from 8:00 a.m. until 4:00 or 5:00 p.m. Given the long school day and heavy academic load, participation in extracurricular activities can be a challenge but not excluded. We do encourage students to be an active citizen, participate in sports events or cultural activities. "Un esprirt sain dans un corps sain". Baccalauréat exams are taken over a two-year period: students usually take three to four exams at the end of the first year, such as in French literature (oral and written exams) and the presentation of the TPE. Students take their main subjects at the end of their final year. In France, a student’s success on the Baccalauréat exam is the sole criterion for satisfactory completion of high school. The Baccalauréat exam is graded on a 20-point scale. A 10/20 or higher is a passing grade. Between 12 and 13.99 receive "Mention Assez Bien" (Honors), between 14 and 15.99 receive "Mention Bien" (High Honors,) and above 16 receive "Mention Très Bien" (Highest Honors). At Narrabundah College, All French Baccalauréat courses delivered at Narrabundah College undertaken by French Baccalauréat students are recognised in full and reported on the ACT Year 12 Certificate. Provided they met the normal ACT Board of Senior Secondary Studies (BSSS) conditions for its award, completing students will receive an ACT Year 12 Certificate in December of the year they complete their French Baccalauréat with "satisfactory" grades reported on the certificate for units completed at Narrabundah College. To what extent is the French Bac recognized by universities? The French Bac is widely recognized around the world. Some prestigious universities may demand a specific mention to apply. English-speaking universities, particularly American ones, value the French Bac as it is often considered difficult to obtain. It is recognized as being a comprehensive rigorous program which guarantees in-depth knowledge. To better meet the English requirements for entry to tertiary institutions in Australia, students are enrolled in an English course during year 11, session 2, in addition to French Baccalauréat courses. It should be sufficient to meet English entry requirements of some Australian University. Other Uni in Australia may require some additional evidence of English proficiency beyond the studies completed for the Baccalauréat. We therefore strongly recommend taking the Cambridge examination offered by Telopea Park School. Why choose the French Bac? What are the benefits of such a broad curriculum? - The core of the séries and the diversity of the branches leads to wide-ranging knowledge and general culture which is particularly useful to any students who have not yet decided on a future career plan. - It is a diploma which is comprehensive in content yet work overload is avoided due to the certain subject areas being grouped (History-Geography, for example), less time allocated to subject areas with a smaller coefficient and the fact that certain subjects are taught for one year as a part of general culture and critical thinking development (for example, SES in Seconde and Philosophy in Terminale). What particular skills will students develop? - The French Baccalauréat prepares students extremely well for the rigors of university study through the skills that are developed. - Students will develop first and foremost, skills of reasoning, analysis and synthesis. They will be required to demonstrate a critical mind, for example, during philosophy class discussions, and need to show initiative and creative skills, especially for the TPE (personal project work). - The French Baccalauréat develops structured argumentative rigor through written tasks and oral presentation skills which will be assessed by an examiner from anywhere in Asia-Pacifique AEFE.